“This is amazin’!” my son calls out as he coasts away from me. He’s been riding for two weeks now, and still he says it every time he hits an easy stretch, when the sun is shining, the road is straight and carless, and the slope is ever-so-slightly in his favor. I know the feeling. My first bike was my trusty companion for years. Sometimes it was my only companion. I was an awkward child, one who couldn’t whistle or cartwheel or kick a ball. Other kids and their ways were a mystery to me. Often, at the end of my block, the neighborhood boys played street hockey; my best friend’s older brothers led the game and sometimes they’d call out to me, “How’s it going Berney?” If I was on foot, I hung my head and kept walking, unsure if they were friendly or teasing. But when I rode my bike, I moved through the world with ease. I rode an old-school Huffy with a yellow banana seat and handlebars that dipped low. When the road was quiet, I’d zigzag up the street, then turn onto the sidewalk so as not to disturb the street hockey game. “How’s it going, Berney?” one of the brothers would call out, and I’d nod and keep riding. My only destination was the quietest road. There were times I wasn’t alone, times when kids I recognized from school cruised out of driveways and rode alongside me for a while. On our bikes we were equals, and together we owned the neighborhood. No one would tease or torment. We just rode in figure eights, up and down hills, easily passing the time. We lost ourselves this way. On the way back to my house there was a gentle hill and I’d lean back and rest my ankles on the handlebars, letting my wheels and gravity carry me. I trusted my bike. My son is not an awkward child like I was, but he has his moments. There are times when he’s too shy to say his name, and times when he is so lost in his thoughts that he walks into a wall. So I was surprised to notice the ease with which he took to his bike. Last week he rode the long straight road to our neighborhood middle school. I walked behind him, calling out reminders for him to stop at every corner, my voice nearly lost in the distance between us. Miraculously, he heard and complied. 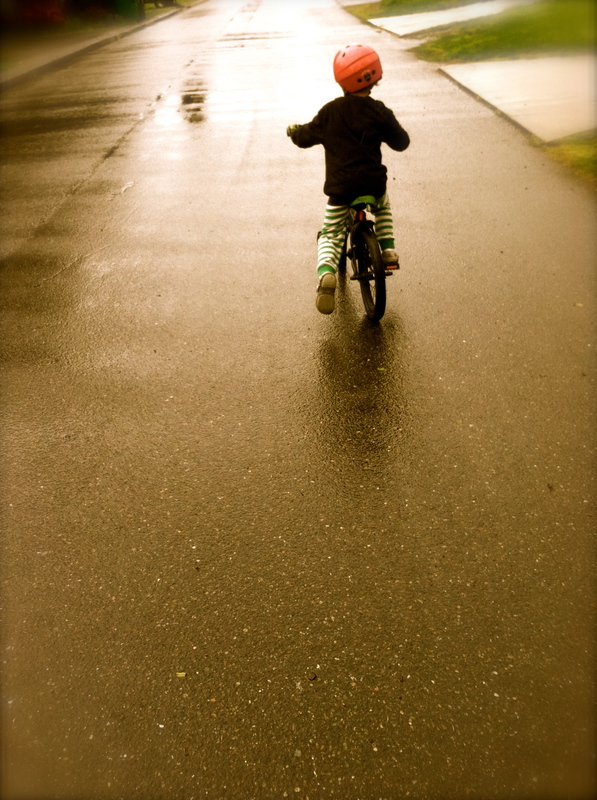 When we arrived, a boy his age rode up and down a long stretch of pavement on a pink bike. My son joined him and they were instant friends, friends of the moment, racing and circling each other. The boy’s father called out “It was his sister’s bike!” I nodded and smiled, hoping that my gestures conveyed that I was not the sort of parent to judge a little boy for riding a pink bike. My son isn’t one to judge either, and I held my breath as they challenged each other with near misses, the boy on the pink bike swooping in front of my son, my son steering away just in time to avoid a collision. As I watched, I tried to summon that same trust that I had when I was a child gliding down the hill with my feet on the handlebars. They rode that same strip of pavement for nearly an hour, sharing the grace of easy friendship. It was long past our usual dinnertime and the sky was growing dark, but I let my son ride until he was sweaty and weary. I was comforted to learn that even in this age of helmets and curfews, of iPads and Netflix, bikes can still amaze. I love reading your memories and your appreciation for your boy and biking. I do remember your other physical talent at a young age: elbowing annoying boys in the back! Well, there was a playground war on. Really nice entry – there is nothing like a bicycle to bring back the memories and emotions of childhood. This beautiful writing reminds me that we can squeeze magic from the most mundane summer moments. Thank you for that. I think I needed the reminder. Most of our summer moments here could use some magic too. We’re enjoying the weather, but we sure do get on each others’ nerves. Loved hearing your story about bikes and then your sons. Sounds like his ride was just as memorable for you. Reading this I picture you watching him and then having that flashback in your head to your own bike rides. I think I’m always comparing his childhood to my own. Can’t get away from it.